At this time of year there’s nothing better than frozen treats to help cool you down in the summer sun. My family loves ice cream and I’m sure my kids would eat it several times a day given the chance! But in the interests of balance and moderation I’m always trying to come up with other new and exciting snacks for them to try. 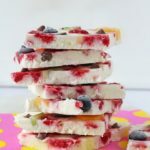 I’ve been making Frozen Yogurt Bark for a few years now and this summer I decided to try a new recipe in partnership with the Department of Dairy Related Scrumptious Affairs. 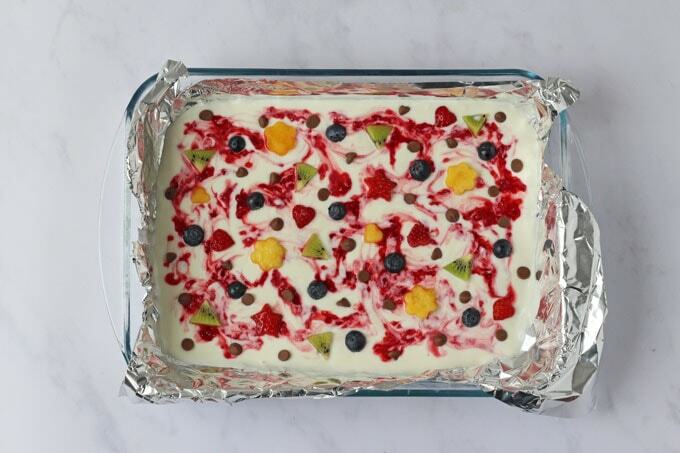 I wanted to create something really fruity, given the abundance of fresh fruit and berries available at the moment. 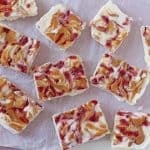 This Fro Yo Bark is so easy to make and starts with some plain yogurt mixed with a little honey. That goes into a baking dish lined with some foil. 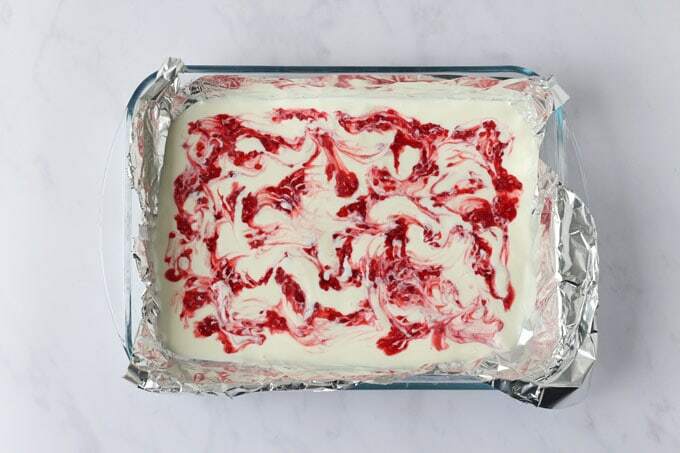 Then you swirl in some mashed raspberries to get that lovely ripple effect. Finally you add your toppings. 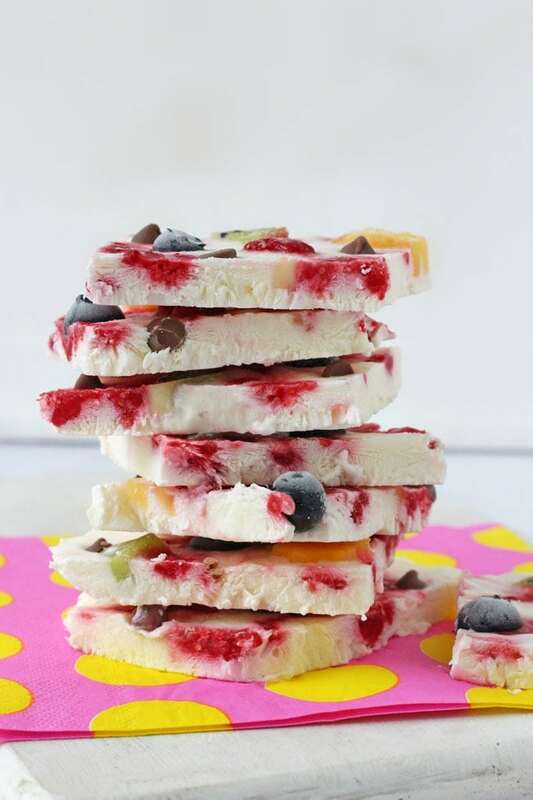 I used some chopped fresh fruit and a few chocolate chips but you can customise it to add any of your favourite toppings. The dish goes into the freezer for 2 to 3 hours and once frozen can be cut or broken into bark pieces. 1. 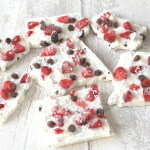 Frozen Yogurt Bark is so easy to make and is a great recipe to get the kids involved with helping. 2. 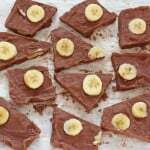 If you don’t eat it all straight away it will keep in the freezer in a bag or container for up to 1 month. 3. You can take the basic recipe and change up the ingredients however you wish. 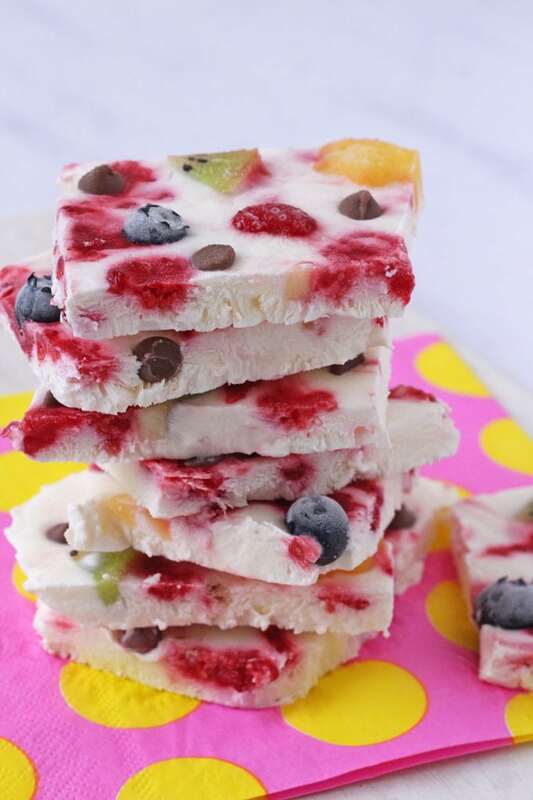 Use a flavoured yogurt or add some different toppings! If you try my Frozen Yogurt recipe please do leave me a comment and a star rating below. You can also share your pictures with me on on Instagram or Twitter. I always love to see your creations! Disclosure: The Department of Dairy Related Scrumptious Affairs is a joint venture between the Agriculture andHorticulture Development Board (AHDB) and Dairy UK. The Department was established last year to celebrate all things diary and remind people of the delicious taste of dairy products – milk, cream,butter, cheese – and of course, yogurt! I have been compensated for my time spent working on this campaign but all thoughts and opinions are honest and are my own. 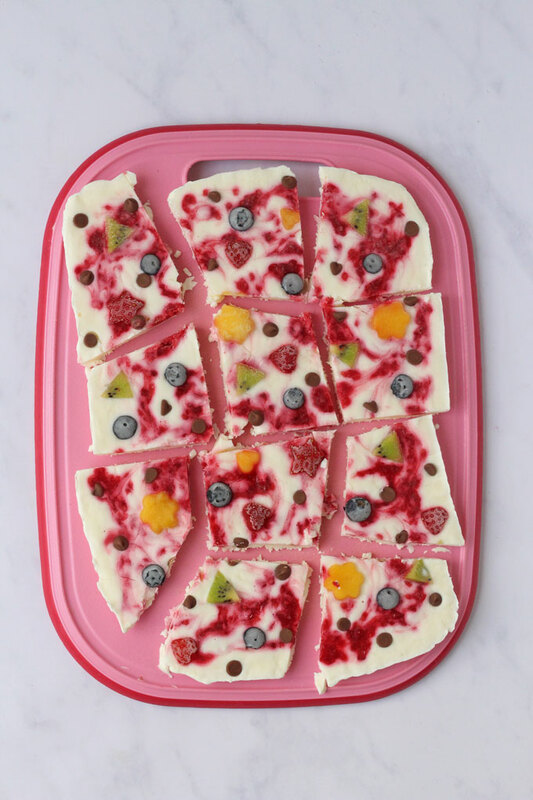 Fruity Raspberry Ripple Frozen Yogurt Bark; an easy, fun and healthy snack to make this summer! Mix the yogurt and honey together in a bowl. 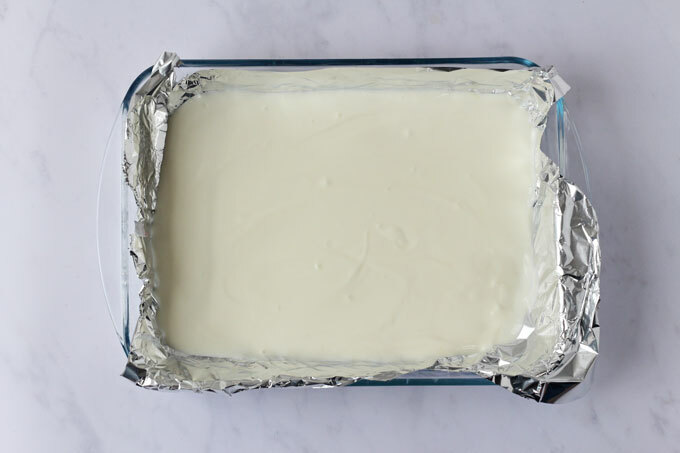 Line a baking dish with tin foil and pour the yogurt on top. Top with the fruit and chocolate chips and then place in the freeze for 2-3 hours until solid. 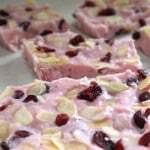 If you don’t eat the yogurt bark straight away it will start to melt. It will however keep in the freezer in a bag or container for up to 1 month. « 15 of The Best Kid-Friendly Smoothies!